Looking for horseback riding excursions & tours in the Cancun area? 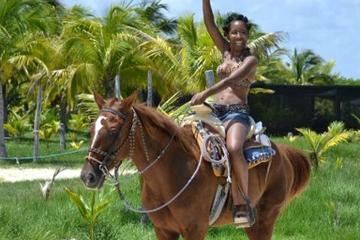 Another fun thing to do in the Cancun area is horseback riding! Ride through the jungle and stroll down the beach along the Caribbean. There are at least a half dozen ranches that offer this excursion. On Cozumel Island there is Mr Sanchos Beach Club (website) and they have won the TripAdvisor Certificate Of Excellence. Mr. Sanchos has over 2,500 reviews on their TripAdvisor profile! On the mainland (Cancun) in Playa Del Carmen there is Rancho Baaxal (website) who has also won the TripAdvisor Certificate Of Excellence. See the Rancho Baaxal TripAdvisor profile here. In Puerto Morelos there is Rancho Bonanza (website) and you can visit their Rancho Bonanza TripAdvisor Profile here. Here is a great deal from Viator, a trusted name in tours and excursions!